The SHOPRIDER™ 888SE with it’s robust design is ideal for people on the move. The four 26 cm (10″) wheels provide added safety and security while it’s narrow width facilitates easy access to all areas. The 888E can attain speeds up to 8km/h. 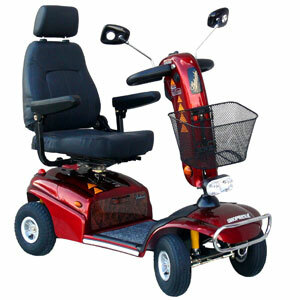 Packed with additional features including front light, rear and side reflectors and horn. The reliability of this impressive Scooter is further enhanced by the rear wheel drive and electromagnetic brake.